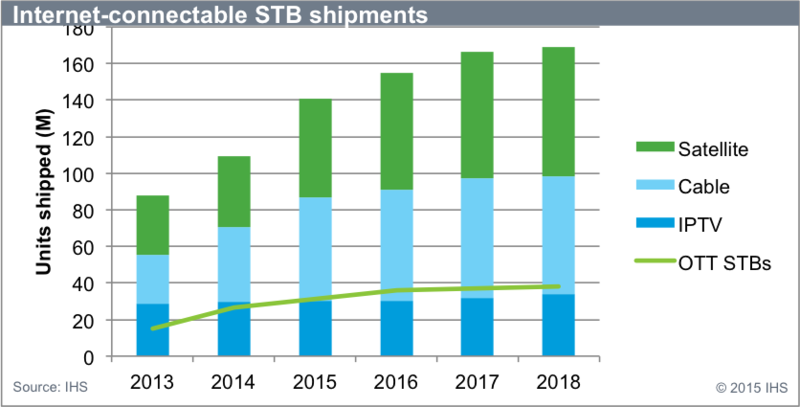 Global shipments of over-the-top (OTT) set-top boxes (STBs) sold at retail — including Apple TV, Chromecast and Roku boxes — will overtake shipments of IPTV STBs used for pay TV services in 2015, according to a new report from IHS, the leading global source of critical information and insight. This year, 31 million retail OTT STBs will be shipped, compared to 30 million IPTV STBs shipped by telcos. Based on the latest information from the Set-Top Box Market Monitor report from IHS Technology, the success of OTT STBs can be attributed to the content strategies of their respective vendors. Apple, Google and Roku have been much more aggressive in adding new content sources and apps to their STBs than TV and gaming console vendors have to their devices. “Ultimately buying a dedicated box enables viewers to choose the OTT services they watch on their TV, rather than simply living with the pre-installed options,” Simmons said. Pay-TV operators have also embraced OTT by deploying their own Internet-connectable STBs and OTT services designed to compete with OTT video providers. Operators are increasingly relying on OTT capabilities in their STBs to enable catch-up TV, larger video-on-demand (VoD) libraries, as well as search, recommendation and other content discovery features. This level of functionality has become a consumer expectation for pay TV services. Some Belgacom, Dish Network, Virgin Media and other pay TV operators have even started providing access to Netflix and other OTT video providers’ services. As global pay TV markets trend towards saturation, total pay-TV STB shipments will decline 5 percent to 197 million units shipped between 2014 and 2018, “Connectable pay-TV STBs will provide an important opportunity for STB vendors to grow their business, despite this overall decline,” Simmons said. The IHS Set-Top Box Market Monitor report provides a high-level overview of the global STB market with volume and value data, regional and platform level discussion, and vendor market share information.